Cayman Turtle Divers offers a Discover Scuba Diving course, also known as a Resort Course, which is a 40-minute class covering all first-time scuba-related matters, including dive safety, equipment use, dive physics, essential hand signals, and underwater physiology. Additionally, there is the shallow water training session that prepares you for 40 ft. Grand Cayman scuba diving. It is critically important that everyone is given the proper tools to execute a safe and fun dive, and we want all of our new, first-time scuba divers to feel as comfortable as possible. Our professional guides are more than happy to answer any questions and give guests all necessary guidance before undertaking their first dive. The minimum age for course participants is 10 years of age. Course cost includes scuba gear and dive, as well as instruction. The courses are offered daily between 9:30 a.m. and 1 p.m. If you choose to proceed to PADI Open Water Certification afterward, the cost of the Discover Scuba Diving course will be credited towards your certification. 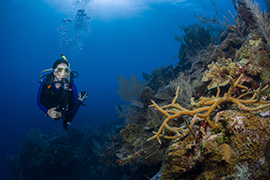 Once you've been introduced to the fantastic world of Grand Cayman scuba diving, we're confident that you'll become as passionate about it as we are! Book your Discover Scuba Diving course today and join us for an experience of a lifetime.